According to the National Climate Data Center, the summer of 2014 was the hottest in the global record. It was a season of record wildfires, sea surface temperatures far above the 20th Century average, and of record droughts and rainfall events around the globe. And it was a year in which the ability of nations to provide food for the world’s seven billion and growing population amidst a mounting tally of extreme droughts and floods was called increasingly into question. On Sunday September 24, 2014, the ever-more alarmed people of the world responded. 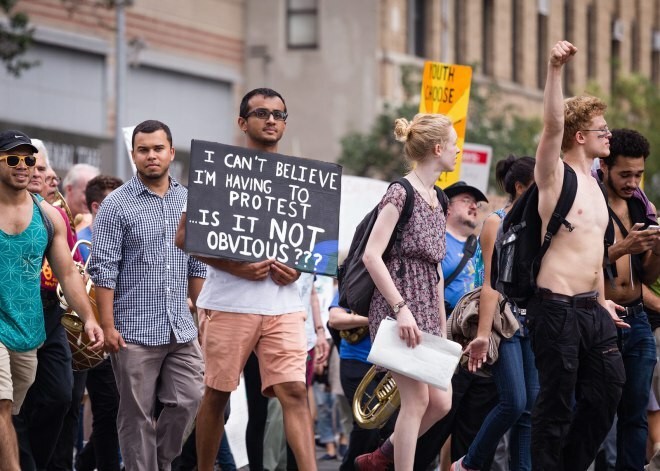 In New York City, an estimated 410,000 took to the streets to protest the broad failure by global governments and businesses to effectively respond to the growing threat of an ever-increasing fossil fuel emission that is rapidly pushing Earth toward a dangerous hothouse environment. In London, nearly 50,000 protesters gathered as Melbourne, Australia saw 30,000 climate marchers. 25,000 lifted their voices in Paris, 15,000 marched through Berlin, and 5,000 gathered in Rio de Janeiro. Overall, more than 2,500 protest events occurred in 166 countries around the world. Total participation is now estimated to be more than 750,000 — the largest and most widespread climate protest in history. 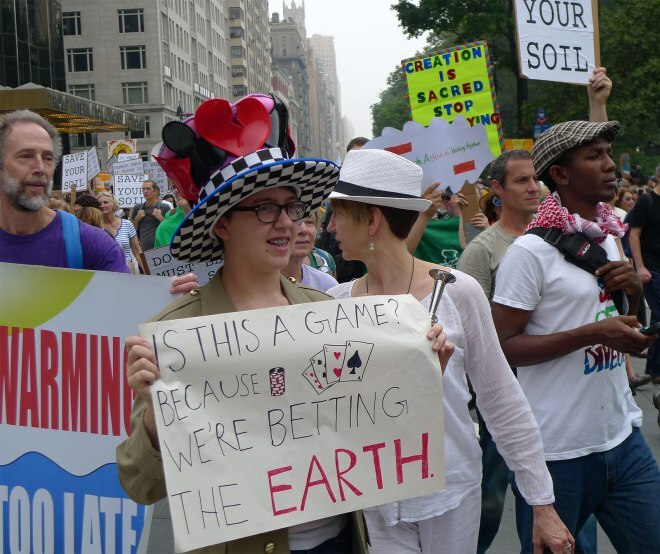 The march, which included more than 50,000 students, numerous members of the scientific community, and such notables as Bill McKibben, Ban Ki-moon, Jane Goodall, Vandana Shiva, Sheldon Whitehouse (D-R.I.), Bernie Sanders (I-Vt), Charles Schumer (D-N.Y.), Leonardo DiCaprio, and Al Gore, at times stretched to fully 4 miles in length. Loud chants such as “Hey! Ho! Fossil fuels have got to go!” rocked what many still believe to be the center of global capital. 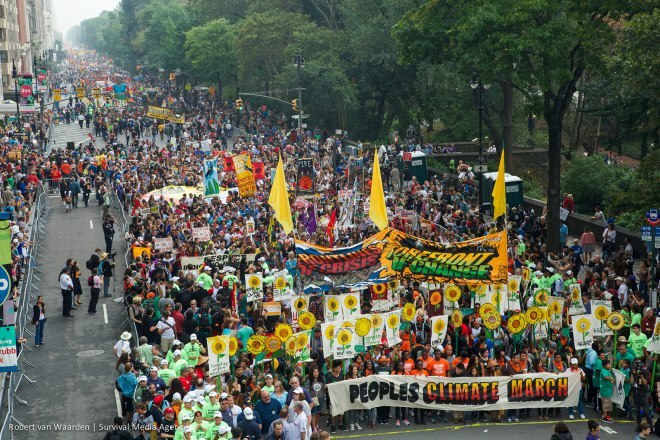 The rallies came just two days before a global climate summit was scheduled to convene on Tuesday, September 22. The summit, which will include more than 120 world leaders aims to provide more aggressive measures to attack the vast and growing threat of carbon pollution. As of 2013, recent studies showed that human hothouse emissions jumped by another 2.3% — primarily driven by increases in China, India and the U.S. Ominously, both China and India — previous bad actors on climate change due to astronomical increases in coal burning — have decided to opt out of the current climate summit. A press conference held prior to the climate march drove home the growing plight of millions of people around the world already staring down the face of fossil-fuel inflicted harm. A number that is likely to jump to billions unless our race toward a hothouse extinction is rapidly halted. Sadly, if world leaders continue to fail to hear the pleas of their increasingly foundering constituents, residents of the Marshall Islands won’t be the only ones on the move. The migration, under business as usual carbon emissions and an emerging and deadly hothouse world will comprise a majority of the human race.